SQL is one of the important programming languages to interact with various Database Systems for many decades. While many languages that existed two decades ago are extinct now, SQL has always maintained its supremacy in the RDBMS world. Over time, it has only advanced with new features and standards. And it seems to stay that way for years to come. Most of the real world applications use relational data in one way or other and SQL is the query language to work with those data. It allows you to query data to find what you are interested in. For example, if you are working for an e-commerce giant like Amazon then you can pull out the best selling items by writing an SQL query. Good knowledge of SQL needs to effectively do your Job. It helps you to understand the data, an important part of your application as well as during troubleshooting. 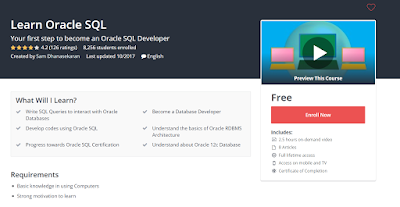 Btw, If you don't mind investing a few bucks on your learning then I also suggest you check out The SQL Bootcamp course by Jose Portilla on Udemy. It's very hands-on and comprehensive course and very affordable too. I bought in just $10 on Udemy sale. In this article, I'll share courses which will help you to learn the basics of SQL and Database. You will learn how to write SQL queries, both basic and advanced e.g. using joins and aggregate functions etc. I have also included a course on Oracle and Microsoft SQL server, two of the most popular database of the modern world which enhance SQL with some proprietary features. 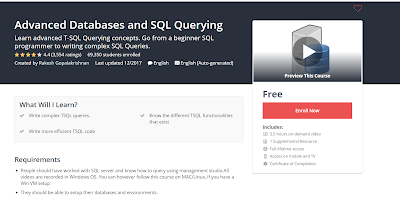 This is an introductory course on Databases and SQL Querying. There are no pre-requisites for this course. If you are looking to get acquainted with the concept of Databases and Queries for maybe your next interview as an analyst, this is the right course for you. In this course, you will learn about writing simple queries including queries related to Dates, String manipulation, Aggregation etc. 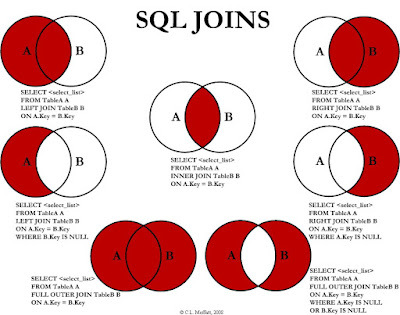 The advanced concepts like joining multiple tables are not covered but you get a good idea of SQL to explore further yourself. In short, a good SQL course for beginners with absolutely no experience in database or programming. Apart from DBA and Application developers, BA, QA, and other people who want to learn SQL can use this course. This is another gree course to learn SQL basics, particularly how to write SQL queries on Microsoft SQL Server. The author, who is a Data Analyst and SQL Developer from Australia have done a good job in explaining tricky concepts like joins to the beginners. In this course, you will not only learn about SQL joins but also how to write aggregation based queries and how to do backups and restores. The course uses SQLServer 2014 express and all the scripts which are used of course are also available for download to make your learning better. In short, good SQL overview courses for students and programmers starting first time with SQL and Database. This course is an advanced T-SQL Querying course for programmers who have basic Idea of SQL and Microsoft SQL Server. It expects that you are already aware of basic database concepts and are comfortable writing basic T-SQL queries like SELECT, JOINS etc. This course covers advanced topics like views, triggers, dynamic queries, pivots etc. If you looking for your next database job or trying to improve your existing SQL Server and T-SQL knowledge and apply in your projects, this is the right course for you. If you have worked with the database in real-world projects then you know that every vendor is different. Each vendor provides some additional functionalities or operator to SQL running on their system. That's SQL query which runs on Oracle might not run on Microsoft SQL or MySQL, unless you are using ANSI SQL. If you are thinking to learn SQL for Oracle database then this is the right course for you. Oracle SQL is a little bit different than ANSI SQL and used for Oracle RDBMS, one of the leading relational database in the world. This is a beginner level course and even if you are starting with SQL and database first time, you can join this course. The author, Mr.Sam Dhanasekaran has more than 20 years of IT experience in Database Support, IT Support and Recruiting, which makes this course even more valuable. 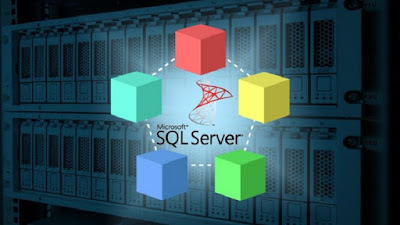 Along with Oracle, Microsoft SQL Server is another popular relational database and it has its own SQL dialects T-SQL. It provides some useful functions and operators to standard SQL. If you want to learn SQL in Microsoft SQL Server then this is the right course for you. In this free online training course, you will learn how to install SQL Server Express for free. You will also learn how to create tables and add data into tables. Once you have your database ready you can start practicing SQL queries. which makes this course ideal for beginner DBAs as well for programmers and application developers who use MSSQL. That's all about some of the free courses to learn database and how to write SQL queries. As I said, SQL is an important skill and every programmer should know it. If you don't know SQL then you should spend some time to learn basic SQL commands and advanced concepts like joins, aggregation and window functions. The time and money spent on learning SQL will server you well in your IT career. P. S. - If you don't mind investing a few bucks on your learning then I also suggest you check out The SQL Bootcamp course by Jose Portilla on Udemy. It's very hands-on and comprehensive course and very affordable too. I bought in just $10 on Udemy sale.